FP-10TM is the ultimate in total care and maintenance of firearms, weapons and weapon systems. 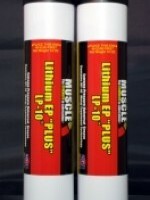 FP-10TM lubricates, guards against extreme pressure and wear, and protects from corrosion. 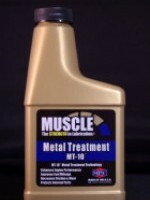 FP-10TM contains Muscle Metal Treatment MT-10® technology for better lubricity and boundary film lubrication. 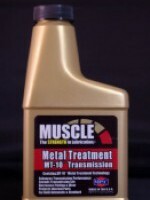 This advantage makes FP-10TM unique by polishing, sealing and protecting metal surfaces. Using FP-10TM allows for improved bore accuracies due to reduced coefficients of friction between the bullet surface and rifling lands of the barrel. How is this possible? Because FP-10TM causes an even build of pressure during ignition. The bullet experiences less frictional resistance from the lands, resulting in an improved accuracy, which is expressed in better average velocities, extreme spreads, standard deviations and bullet groups. To jump to further information on improving firearm dependability, click here. Burnt powder accumulation through firing. Many semi- and full-auto weapons dysfunction after periods of fire sufficient to build up and transfer high heat to the receiver and its moving parts. This occurs because the intense heat changes the fine tolerances of the weapon through swelling and the vaporization of existing lubricants in critical areas of operation. This causes an increase in frictional coefficients with the slides, bolt carriers and other moving metal parts. When this occurs, the spring forces, originally engineered to function under proper conditions, become stressed and will not exert the increased force needed to eject spent casings and retrieve new rounds from the magazine while delivering the bolt carrier to its full battery position. FP-10TM will permeate the metal surfaces of all moving metal parts to which it is applied and dramatically increase the lubricity. Even if FP-10TM appears to "vapor off" under intense heat, the boundary film layer created by this product will still be present and continue to provide lubricity and low coefficient of friction operation. FP-10TM will reject dust, sand and other airborne particulates from the surfaces of the weapon because of its lubrication technology, which forms a chemical boundary film through reactive chemical bonding. Additionally, FP-10TM protects the firearm from rust and corrosion that can be caused by exposure to rain, salt water and other forms of moisture. Please note, however, that an excessive amount of any kind of oil tends to attract dirt. 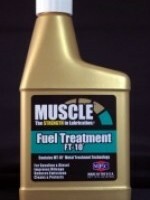 Use FP-10TM in a modest to light application and wipe off the excess lube. As with adverse environments described previously, FP-10TM will reject burnt powder and fouling from the lubricated surfaces of the weapon. This technology prevents the accumulation, or buildup, of copper and gilded metals from jacketed bullets when FP-10TM is used regularly to lubricate, clean and protect the weapon. When used as a cleaner, FP-10TM removes burnt powder and lead better than any non-corrosive product in the marketplace. A thorough swabbing of the chamber and bore with a patch wet with FP-10TM, then allowed to sit and work briefly will remove the powder and leading. In severe cases of lead buildup, FP-10TM should be left in the bore from two hours to overnight. This allows FP-10TM to work through and tunnel under severe accumulations, entirely removing the buildup from the bore and chamber.